Are available from late spring through the early fall months when the turtles are active. Educational presentations are available to clubs, organizations and any youth or adult group desiring to learn more about the Turtles in our world, and how we can help them survive. Our Educational Presentations are hands on and may include Box Turtles, native water turtles, and some exotic turtles. 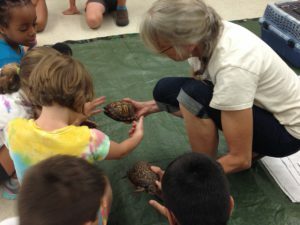 Your group will learn about the life of a Box turtle and be able to examine shells and touch live turtles. Younger groups enjoy the turtle puppets and older groups have the option of a power point. Form and Function: Learn how to tell where a turtle lives, by looking at its features, and clues to learn how to tell them apart. What do you do if you find a turtle? How you can create a turtle friendly yard. That Amazing Shell: learn how incredible adaptations gave the turtle the power to survive catastrophic events that caused many creatures to go extinct. 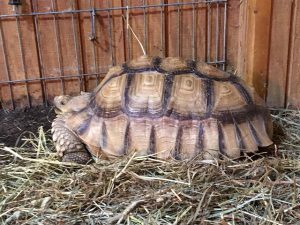 Special turtle guests include Sully, our African Spur thigh tortoise. Reservations are now Available for summer 2018, weekends fill fast, so if you are looking for a change from that teenage mutant turtle party, this is a great opportunity to teach your students about these modern day dinosaurs. Presentations are built to suit your needs and can be adjusted to run from 30 to 90 minutes. (45-60 minutes is ideal) The turtles that are used in the programs are former pets that are unable to be released back into the wild.